Dimensions 1 by 5.80 by 9.10 in. Amazon.com description: Product Description: This classic volume should find its place on every design student's bookshelf. Here is the history of the printed word, from the earliest alphabets through the evolution of the printing press. The contributions of the great printers and typographers are here. A new chapter by Robert Bringhurst takes up this history where Chappell put down his pen, covering the most recent developments in the printed word. Over 200 illustrations appear throughout. With Robert Bringhurst | 2 rev upd edition from Hartley & Marks (April 1, 2000); titled "A Short History of the Printed Word"
About: This classic volume should find its place on every design student's bookshelf. 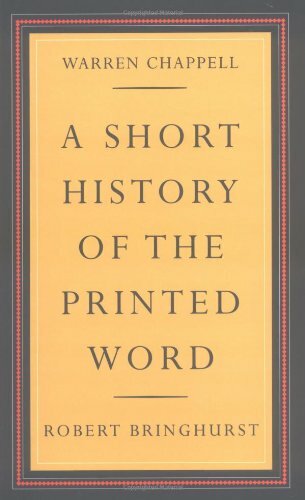 Reissue edition from David R Godine Pub (September 1, 1984); titled "A Short History of the Printed Word"